Adding a separate GND wire for the video (yellow wire) is optional but recommended. Diagram assumes you are using a screen that works on 5V power like the GearBest Screen. Where does the av1 (white) from the screen go? How are you connecting a 2nd ground from the screen pcb? Isn’t it common, can I just loop it from where ever? 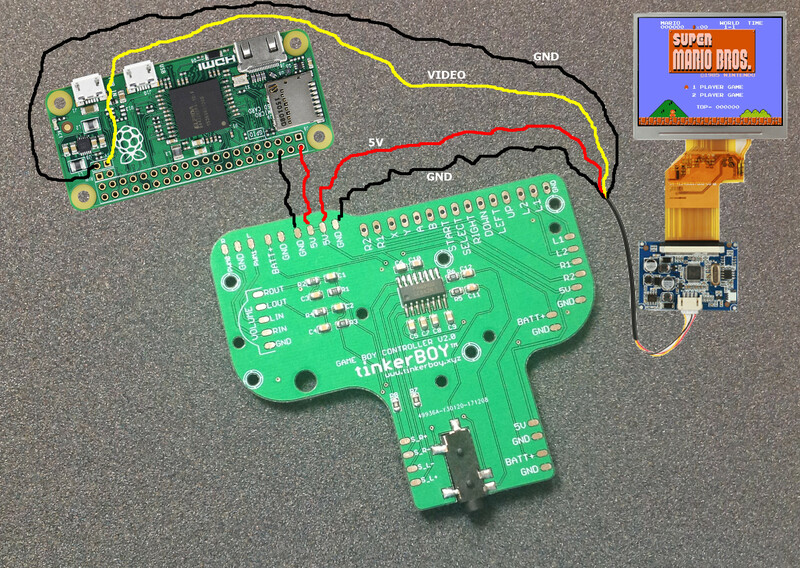 You can find the screen wiring guide at http://www.tinkerboy.xyz/screen-wiring-guide-for-game-boy-controller-v2-0-v2-1-v1-1/. Just find any common gnd from the pcb screen and connect to any gnd on the board. Is there a way of controlling the brightness on this screen? No sorry there’s no way to control screen brightness. Hello do you know a screen that doesn’t use AV interface? On my tinkerboard I have only HDMI,MIPI DSI or SPI. the HDMI screen I use is to gib to feet correctly in the DMG case. The only hdmi screen i know is the KEDEI 3.5″ screen.